FILE - Chinese Uighur activist Dolkun Isa, seen in this July, 6, 2015 photo, is chairman of the World Uighur Conference, which advocates human rights and democracy. The brief detention of a prominent exiled Uighur leader in Italy last week is raising alarm among human rights groups, who see it as a sign of growing Chinese political influence in Europe. Feeding that concern is the role played in the arrest by the international police organization Interpol, which since November has been headed by Meng Hongwei, China's deputy minister of public security. Last Wednesday, Dolkun Isa, the secretary general of the Munich-based World Uighur Congress (WUC), was stopped by police in Rome as he was preparing to address the Italian Senate about restrictions facing his people in China's western Xinjiang province. Isa, now a German citizen, was taken to a police station where he was photographed, fingerprinted and held for more than three hours before being released. 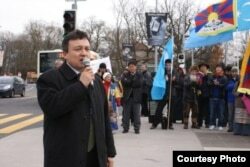 FILE - Dolkun Isa, Chinese Uighur rights activist and chairman of the World Uighur Conference, which advocates human rights and democracy. The detention was described to Isa as an "identity check." However, he said the Italian police also told him that he was picked up because his name appeared on Intepol's list of "red notices," indicating individuals who are wanted by police in any of the group's member countries. China issued the red notice in 1997 and placed Isa on its most-wanted terrorist list in 2003, though Isa and his supporters maintain the listing was politically motivated. The arrest "was a big shock for me because I believe that democracy, human rights and the rule of law are the basic values of the Italian democracy, Italian government," Isa told VOA. He expressed frustration over what he sees as a willingness in the West to cave to political pressure from China in exchange for economic benefits. Meng Hongwei (R), Chinese vice public security minister, shakes hands with Nguyen Quang Dam, the commandant of the Vietnam Coast Guard, in Beijing, China, August 26, 2016. This was not the first time that China has tried to block Isa from advocating for the Uighurs, a mainly Muslim ethnic group. He said he had been stopped before in New York, South Korea, Turkey and Switzerland. The WUC has demanded the European Union investigate whether China pressured Italy into detaining Isa. "The EU should be awakened and re-adjust its policies toward trade and political exchanges with China," said WUC spokesman Dilxat Rixat. The EU hasn't responded to VOA's request for comment. Chinese Uighurs have long complained of discrimination and attempted assimilation by the dominant Han Chinese, and hundreds of people have been killed in Xinjiang during violence between the two groups. Uighurs describe the violence as a response to ethnic repression, but Beijing links it to Islamist terrorism elsewhere in Asia and has reacted with increasingly harsh measures. FILE - A police officer checks the identity card of a man as security forces keep watch in a street in Kashgar, Xinjiang Uighur Autonomous Region, China, March 24, 2017. "I used to say that China was practicing the carrot-and-stick approach to the Uighur problem," said Dru Gladney, a professor of anthropology from Pomona College in California. "But now it seems like the carrot is being completely removed and the stick is increasingly enlarged greatly." Starting in September, the use of Uighur language will be banned at all school levels in Xinjiang. China also has barred Uighur parents from naming their newborns "Muhammad" or using other names that it says have "extremely religious" meanings. "It is exactly the cultural genocide policy of the Chinese government toward the Uighurs," Isa told VOA. "Uighur language is one of the main factors of Uighur identity. If you change your language, then, maybe 60 percent of identity would be lost. And another identity is religion. That's why the Chinese government today makes more pressure [on] religion and the language," he said. Michael Clarke, an associate professor at Australian National University's National Security College, argued that China's intensified deployment of such controls will only heighten pre-existing anxieties among the Uighurs. "There is no doubt that such policies exacerbate not only inter-ethnic tensions [i.e. between ordinary Uighurs and Han Chinese], but also Uighur relations with state institutions," the professor told VOA by email. Professor Gladney of Pomona College called on the Chinese government to ease its heavy-handed controls in Xinjiang or face what he called "a speed bump" in its Belt and Road Initiative — an infrastructure project that passes through the far west region. To execute the project, China needs popular support from countries in Central Asia or Arab states of the Persian Gulf, where Muslim populations are increasingly angry over China's treatment of Uighur Muslims, he said.